Gold… pink… an awesome die… MME… eeeek. So I've created a card with some of the gorgeous My Mind's Eye journaling cards and die cut pieces. I layered them together, added a cute stamped sentiment, some stitching with the lovely embroidery floss from the kit, and adhered it to some of the pretty papers. I inked the butterfly with the gold ink from the kit and added a couple of shiny gold hearts to tie in with the gorgeous heart paper. Isn't it sparkly!!! Pop back tomorrow for another card created with this gorgeous kit. I wanna see more of this kit! 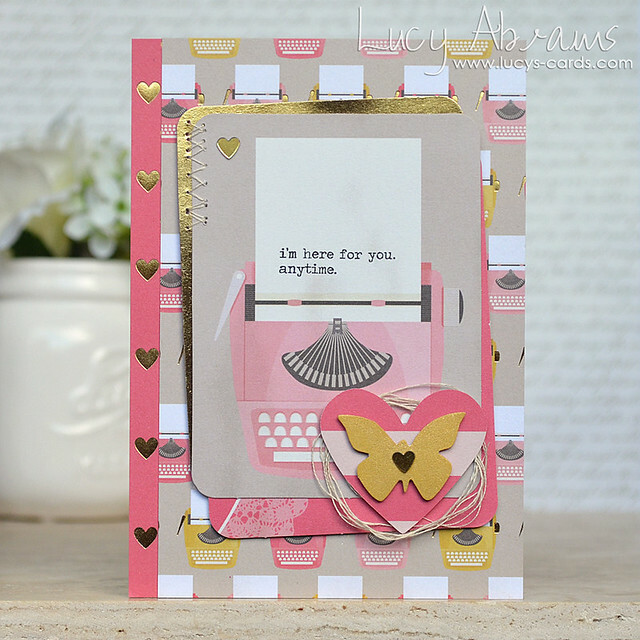 Think you card is jam-packed with gorgeousness. Love how you assemble the elements from this kit. Wow what a beautiful kit!! So nice to see those bright colours and fun design for an October kit! Love it. This months kit ROCKS! I'm excited for mine to arrive....I'm stalking the mailman. I really like this card kit. All of the designers have great ideas for this kit. Lots of layering, which I love. Very nice cards. I like seeing the versatility of the journaling cards. What a great kit. You can do so much with it. Love the heart and your stitching. I'll have to try it. Wonderful card. Stay blessed! Great cards. I can't wait for my kit to come! Love, Love this card. Great card kit. Thanks for sharing. Love the pink & gold!